Do swimmers in your lake or pond emerge with itchy welts resembling large mosquito bites? Swimmer's itch (cercarial dermatitis) is a skin reaction from the larval stage of certain aquatic flatworms (Trematodes) that mistakenly burrows into the epidermal layer of a swimmer's skin. It causes itchy, but not life-threatening, welts that last a week or so. These flatworms are parasites, normally living off of several animals (hosts) in a cyclical fashion; usually a bird, a snail and sometimes a fish. This fact dictates the prevention methods that will be discussed later. The life stages are cyclical. 1. Eggs released from the adult worms that reside in the blood vessels of the bird host, make their way into the digestive tract and then pass out of the host with the feces. 2. They eggs hatch into the miracidium, an aquatic stage, which is free-swimming, but nonfeeding. It searches for a snail that it will penetrate into. 3. Within the snail, the miracidium will produce a larval stage, called the cercaria. This stage burrows out of the snail, becomes a second type of free-swimming, nonfeeding, swimming aquatic stage that enters the bird/fish host by penetrating the skin. If they try to enter human skin, it results in Swimmer's Itch. 4. If the final host is a fish, the parasite forms a metacercariae stage, often visible as yellow cysts or black spots just under the skin of fish. 5. When the fish gets eaten by a bird, the parasite matures in the blood vessels, completing the cycle. People get swimmer's itch when the cercarial stage accidentally enters their skin. Usually within 30 minutes, a small red spot appears at the site where the cercaria penetrated. This red spot will continue to increase in size for the next 24-30 hours. The raised, reddened spot is now called a papule. It will continue to itch for up to a week. Papules are limited to areas of the body that get exposed to water because cercariae can not live out of the water. For a few species of schistosomes that cause swimmer's itch, toweling off may help; with most other species, it will not do any good because the cercariae penetrated the skin while the person was in the water. No, it is impossible to observe larvae in the water without a microscope. They are approximately 1/80 of an inch long and transparent. Can you eat fish that have the yellow or black cysts in the flesh? Although these parasites are rather unappealing, they will not infect humans, and are killed when fish are thoroughly cooked. Even if the fish is eaten raw, these parasites are linked only to a specific bird host and will not survive in humans. The free-swimming larval stage of the trematode is hard to eradicate, so control is focused on the animal hosts and their pond habitat. Bird hosts. In fish ponds, the main bird host is the Great Blue Heron. Other hosts include cranes and bitterns, kingfishers, mergansers, mallards, Canada geese, swans, red-winged blackbirds and Muscovy ducks. As most birds are protected, scare tactics and netting are usually used. Snail Hosts. Because snails are an essential part of these parasites' life cycle, the presence of fish that eat snails, or chemicals that kill them, can reduce the abundance of such parasites. Sunfish, carp and crayfish help to control snails. Hydrated lime or copper sulfate is usually applied along the shallows where snails like to live. Fish Hosts. 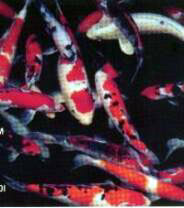 Most pond owners prefer fish, so removing them is not an option. Even if you remove all fish, there still remain the majority of trematode parasites that do not use fish as an intermediate host. Weed Control. Snails congregate where there are plants. Controlling plants will control the snails. Copper-based herbicides are the most common chemical treatment, but use them carefully because they can be toxic to fish. Thank you for searching for pond management information on JandJAquafarms.com. We have a team of pond, plant, and fish experts that will work hard to maximize the health and beauty of your aquatic environment!